In the face of ever-declining biodiversity, zoos have a major role to play in species conservation. 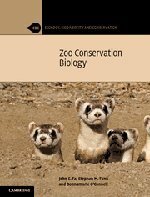 Written by professionals involved in in-situ conservation and restoration projects internationally, this is a critical assessment of the contribution of zoos to species conservation through evidence amassed from a wide range of sources. The first part outlines the biodiversity context within which zoos should operate, introducing the origins and global spread of zoos and exploring animal collection composition. The second part focuses on the basic elements of keeping viable captive animal populations. It considers the consequences of captivity on animals, the genetics of captive populations and the performance of zoos in captive breeding. The final part examines ways in which zoos can make a significant difference to conservation now and in the future. Bridging the gap between pure science and applied conservation, this is an ideal resource for both conservation biologists and zoo professionals. Written by professionals directly involved in in situ conservation and restoration projects internationally, this is a critical assessment of the contribution of zoos to species conservation through evidence amassed from a range of sources. It is an ideal resource for both conservation biologists and zoo professionals.